Though Walter Hill's 48 Hours was released in 1982 it still retains a rather late 70s feel. Jack Cates' (Nick Nolte) wardrobe has very nearly the same drab brown button down formality of Eastwood's Harry Callahan except Cates appears to be loosening up ever so slightly for the new era. He wears blazers, but no tie or sweater. His oxford shirt is unbuttoned at least to the second or third button. Instead of slacks, he wears fitted boot cut jeans and cowboy boots. He is casual yet still formal. When Cates and Reggie Hammond (Eddie Murphy) are introduced in one of the earlier scenes in the film, it is evident that Cates is a little square on fashion. Hammond makes a point of correcting Cates' assumption that his suit cost $500 when in fact its price was close to $1000. Aside from differences concerning fashion, Cates and Hammond clash in other ways. One source of tension is that Cates is a cop who needs Hammond, a criminal, to help capture a fugitive named Ganz (James Remar). The primary cause of the friction, however, is racial- Cates is white and Hammond is black. It is clear from the outset that Cates is not too thrilled about black people, referring to Hammond first as "watermelon", "a charcoal-colored loser", a "spear-chucker" and then later breaking out the biggest racial slur of them all in a dramatic confrontation. Not only is Cates sporting a similar though modified look as Harry Callahan, he is also carrying over the racial attitudes of the previous era, using racial epithets with the same aplomb as Callahan. Cates is slightly more open and relaxed than Callahan, however. In this way he ceases to be a 70s character and becomes more of an 80s one. Sure, he's tough and somewhat formal as evidenced by the blazer, but he has a swagger, a looseness. There is, from the outset, banter between Cates and Hammond that, as the film progresses, becomes friendly as opposed to hostile. Of course, this follows the true buddy cop (Hammond becomes an honorary cop in this film) movie formula. 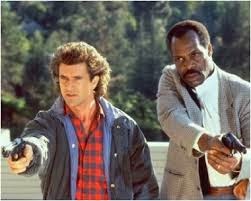 Certainly, 48 Hours can be credited with paving the way for a later and even more popular interracial buddy cop film, Lethal Weapon. Richard Donner's Lethal Weapon was released just five years after 48 Hours but the mood couldn't be more different. Though they both take place in California, 48 Hours' San Francisco and Lethal Weapon's Los Angeles seem worlds apart. Where Cates and Hammond visit San Francisco's grimiest spots, Riggs and Murtaugh are searching for drug smugglers in the glitziest LA clubs. When Sgt. Riggs (Mel Gibson) and Sgt. Murtaugh (Danny Glover) meet, they, like Cates and Hammond, take an instant dislike to each other. This dislike isn't due to their racial differences, nor to different life experiences (they're both cops) but rather because Murtaugh perceives Riggs to be a loose cannon and Riggs fears Murtaugh is going to be a strictly by the book type of police officer. If there is racial tension in this film it isn't expressed. In five years, open use of racial slurs in films had become frowned upon. There are, however, clear racial roles in this film. Though they share nearly equal screen time, somehow Gibson's Riggs seems like the main character, while Murtaugh is something of a satellite, an accessory. Though Murtaugh has been an officer longer, Riggs is characterized as braver and smarter. In one scene in a firing range, Riggs shows off his shooting skills by achieving a near impossible shot from a great distance, thereby making Murtaugh's impressive shooting seem lackluster by comparison. The point is made early on in the film as to whom is the most masculine. Murtaugh seems to accept this role without question, seemingly following Riggs' lead as the film progresses, though he is the older, more experienced cop. Nevertheless, these roles seem to suit both characters and they successfully fight crime while becoming partners and friends. Both 48 Hours and Lethal Weapon focus on race, the latter more subtly than the former. Each film provides a showcase on the ways in which race and masculinity intersect. In 48 Hours, Murphy's Hammond is a jive talking criminal who revels in his ability to be infinitely cooler than Cates. Yet he is never portrayed as suitable competition in the masculinity department. He gets his moment to play cop in a redneck bar, but uses a slur to describe himself during the only moment where he truly gets to display an authentic masculinity. Alternatively, Glover's Murtaugh is an upstanding character, a family man and respected police officer who still cannot compete with Riggs' toughness, intensity, bravery and shooting skills. 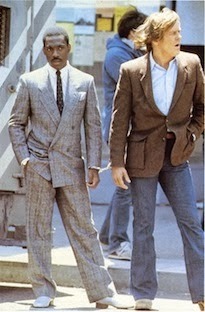 Hammond and Murtaugh both are much more formally dressed then their white counterparts, remaining in suits throughout the duration of both films. Yet in Hammond's case the suit is too flashy to garner respect, while Murtaugh's suit seems to suggest advancing age and irrelevance. No matter what they do or wear, they still don't quite measure up. Curiously and rather contradictorily, these films likely played a role in lessening racial tensions at the same time that they play to the racial status quo.